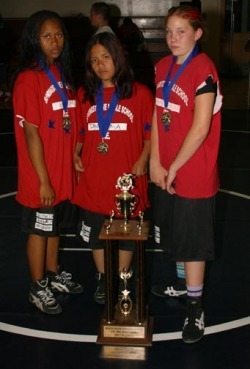 Maribeth Grim and Jackie del Pilar become the 1st female wrestlers for Springstowne Middle School. Ruby Nabong becomes the 1st 3-Year Lady Wildcat. Marc-Keia Jones, Donna Mia and Angela Miller become Springstowne's 1st USGWA Nor-Cal Champions. Mary Jane Fernandez and Ariana Reyes take gold at the Inaugural California Girls Middle School State Championships. The Springstowne Lady Wildcats earn their 1st California Girls Middle School State team championship. Brenda Luke, Gabriela Sandoval, Alisa Gortchakov, Michaila Foster and Samantha Mercado are among the 1st 3-time California Girls State Medalists. The Lady Wildcats travel to Hawaii. The Lady Wildcats and the Bancroft Lady Broncos square off in the 1st Middle School Girls dual Meet in U.S. History. Springstowne prevails 37-16. Alyssa Wong is awarded The West Coast National All-Tournament MVP award. Katrina Abueg wins gold at the USA Wrestling National Championships in Oklahoma and becomes the 1st Lady Wildcat 2-Time State Champion. Clarissa became the 1st Lady Wildcat to go undefeated. Her 29-0 record included championships in 3-States ... California, Kentucky and Tennessee. Ricki Liang becomes the 1st Lady Wildcat 3-Time California State Champion and is honored by Fulp-Allen Wrestling after going 26-0. Shelly Avelino made history as the 1st individual to score three pins in three finals appearances en route to three California Middle School State Championships. The USGWA proclaims "The Springstowne Lady Wildcat Wrestlers are the greatest female dynasty since Cleopatra and truly are America's Team"